Using virtual office/workspace providers can be a good solution to setting up your business mailing address that gives you access to many additional business services. One such virtual office provider is Regus, which has recently partnered with Austin-based company LifeSize (a division of Logitech) to provide Regus customers with state of the art videoconferencing rooms. 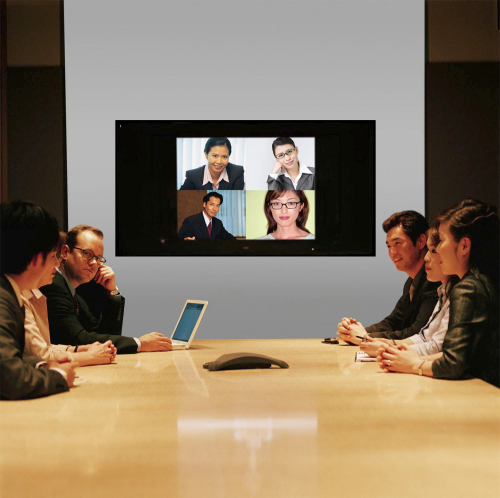 LifeSize has been tapped to install HD videoconferencing suites in more than 240 Regus locations around the world. Videoconferencing can be important for the startup with remote employees and/or partners who need frequent, clear communication with one another. It can also give the small business a professional image when interviewing candidates through video or pitching to investors online. Using a virtual officer provider like Regus will give you maximum flexibility, as its services can scale right along with your business. At ChooseWhat.com, we have used a virtual office provider since the company started and highly recommend it to any business that needs a flexible mailing address and wants to take advantage of time-share work spaces (you can schedule the space and rent it out to other companies) and high quality videoconferencing tools. For more about virtual offices and other mailing address options, see How To: Set Up a Business Mailing Address. This is pretty cool, but is there an additional cost? I could see myself using it if it came as part of the standard vo package.